The technique Ross developed is widely recognised as an amazingly gentle, safe and simple to apply muscle release therapy based on an understanding of the body’s response to light touch. Ross has a rare and special gift which allows him to see each client's needs at that moment, to know what to do and to adapt accordingly, so the treatment is tailored to each individual client. This chameleon approach has long been the major success in the EMMETT Technique and produces outstanding results time and time again. Often hailed as a 'gifted healer', a tag Ross rejects saying "I simply notice things other people don't; I have found ways to stimulate the body's ability to self-correct and as a therapist I have been able to use this insight to help people. I was encouraged to share this with others so they could do the same. I developed what is now taught as the EMMETT Technique - to get the information out there and to be able to assist many more people than I could reach alone." There are now tens of thousands of people trained in the EMMETT Technique worldwide. The EMMETT Technique first evolved as a means for Ross to treat sick and distressed animals. Ross has always cared for animals and for their wellbeing. His experience in working as an animal attendant, Australian Dog Obedience Judge and a successful animal trainer have assisted his unique insight and the development of the method. Ross discovered that the technique worked as effectively on the handlers as it did on their animals. 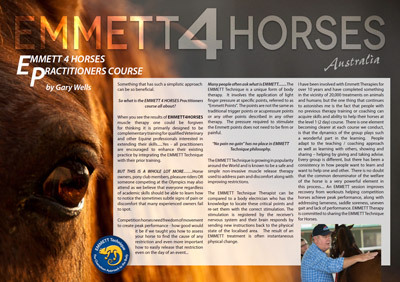 Many people undertake the EMMETT Technique training today as a means of treating their animals, particularly horses and dogs. Working in bodywork as a Massage and Remedial Therapist running busy clinical practices in Mt Isa (1981-1999) and Townsville, Australia (1999-2008) gave Ross the opportunity to further develop the technique. What originally began as a massage business in Mount Isa in the early 1980's, Ross Emmett developed a reputation for getting fast, effective results with his clients. His busy Mount Isa practice treated on average, 100 people per week. Due to his location in the Australian Outback, his clientele over the years were often people from cattle stations and mines situated hundreds of kilometres away. They had limited access to therapy and limited time for treatment. The visit to town needed to provide both instant relief and lasting comfort for these clients, due to their inability to receive follow up treatments. 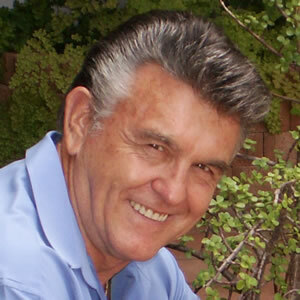 In 1983 Ross began teaching Massage Therapy and has since taught many other modalities including Bowen Therapy. Through the support of other practitioners, and in particular the encouragement of a Townsville Doctor, he started teaching his own technique, commonly known now as the EMMETT Technique. Ross's years in outback Australia have shaped him into what he calls a 'bit of a bushy' - forthright, direct and a bit rough around the edges; the international media have referred to him as the 'Colonial Cowboy'. Ross describes himself as a "Chameleon", adapting treatment to suit each client's specific requirements. The resounding gratitude reflected amongst many incredible testimonials Ross has received over the years from clients and Emmett Practitioners alike reflect the achievement of great results including, relief from back pain, neck and shoulder pain / stiffness and restriction, hand, wrist, elbow pain and restriction, leg and knee pain and headaches. They also report increased movement and flexibility, balance, lung capacity, and straightening and aligning of the body. Ross's collection of letters and credits are, in short, simply amazing; he often has referrals from Doctors and specialists, to assist with patients that others have been unable to get results. He now travels throughout Australia and the world, lecturing and holding seminars to share his own unique insight into bodywork and the EMMETT Technique.